The revision for the ISO 31000 standard is to be finalized in 2017. In a series of articles we want to present and discuss the major changes that are to be expected. 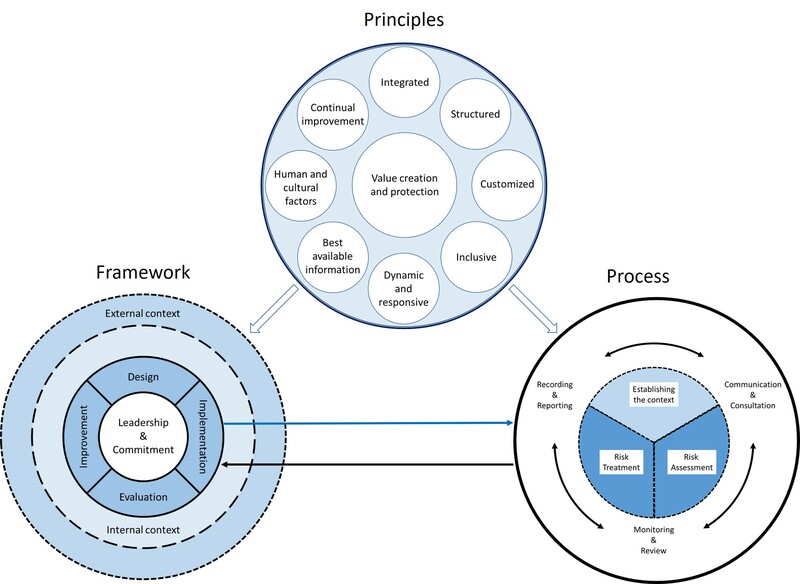 In Part 1 we discussed the introduction of the document and the new graphic lay-out of the framework and process of the revised ISO 31000 risk management standard (see figure below). It immediately shows what the intent of the revision is. The update intends to make ISO 31000 a very concise high level document on risk management. It is mainly achieved by reducing the level of information, keeping it to the strict minimum. This approach should be in concert with the ambition of ISO to develop a whole series of ISO 31000 documents, related to the different aspects of risk management. This similarly to the ISO 31004 and ISO 31010 documents that are already available at the moment. The idea is then for these supplementary documents to accommodate for any specific information regarding risk management which is not contained in the ISO 31000 document. When looking at the section “Scope” in the revised standard, the reduction of the content is clearly visible. Instead of the scope being elaborated on half a page, it is now explained in less than 5 lines. This is mainly achieved by deleting large parts of the original text. However, there are some remarkable changes in this draft 2017 edition. In the proposed version, ISO 31000 talks about “adaptable guidelines“, instead of “generic guidelines“. It also mentions that the standard is “to be used by any organisation“. This instead of the old phrase that the ISO 31000 standard “is not specific to any industry or sector“. Maybe the most notable change in the scope is that the sentence “This International Standard is not intended for the purpose of certification” is no longer there. This leaves a door open for those who want to have a standard also to be used for certification. This is a new section in the standard. It only mentions that there are no normative references in the document. I suppose this is only to comply with the newer formats ISO uses for its standards. The major change in this section (at least to me) is the fact that the following sentence has changed. As this sentence was followed by 29 definitions that fully defined risk management the ISO 31000 way. As a consequence, now for ISO 31000 all definitions that are mentioned in the ISO Guide 73 apply. As the Guide 73 is to cover all ISO definitions regarding risk and risk management, this shouldn’t come as a surprise. It is to be noted that nothing of the wording of the actual definitions has been changed. The changes in the revision only concern the notes to the definitions. RISK (change for the notes), RISK MANAGEMENT (no change), STAKEHOLDER (no change), RISK SOURCE (change for the notes), EVENT (change for the notes), CONSEQUENCE (change for the notes), LIKELIHOOD (no change), CONTROL (change for the notes). In general the changes are in the direction of a better wording and more complete coverage of what the notes want to convey. However, there’s one note that really catches my attention and that in my opinion can be improved. It is note 1 of the definition of risk. The problem I have with this sentence is the parts between brackets. The content between brackets should be left out. Because in my opinion, opportunities and threats are (external) risk sources in the same way as weaknesses and strengths are (internal) risk sources. Although effects can also become risk sources, the way note 1 is phrased only leads to a short sighted view on what can be understood by effects. For example, one could say that pursuing an opportunity, making use of ones strengths, while managing threats and weaknesses, can bring unexpected positive consequences. However, pursuing opportunities without managing threats and weaknesses and not building on strengths, can certainly bring about unexpected and unwanted consequences. The consequences are then the effects of uncertainty on the objectives related to the opportunity pursued. So my proposal for note 1 is “An effect is a deviation from the expected. It can be positive, negative or both.”. There’s no need to add anything to that! In general, one can say “less is more” and this is certainly true for this revision. More interpretations are possible, more definitions come into play and more options in the use of the standard are provided (e.g. certification). The one remark I have is the note 1 on the definition of risk. Do you want to know more about ISO 31000 and its revision? Are you looking for certification for this standard? Do you want learn how to integrate risk management at all levels of your organisation and all of its operations? Join us for one of our certification courses in Brussels or Frankfurt or contact us for an in-house training! But I think that threats and opportunities can also be internal risk sources and not just external ones. You are absolutely right Francesco. Threats and opportunities can be categorized being internal from an organisational perspective. However, this is a bit less likely from a personal perspective. It is just a way on how I like to categorize elements in a SWOT. Internal threats can easily be seen as weaknesses and internal opportunities can also be seen as strengths of the organisation. But in the end these are all risk sources and not necessarily effects as note 1 to the definition of risk in the revision might presuppose. Is there anywhere to view a copy of the new draft? I have not purchased ISO 31000 but am interested in reading it. The cost of the material is a barrier to review and implementation. I’m agree too, but they forgot a review about what can be risk sources. In this case, where is the risk source? Definition of a risk source: Element which alone or in combination has the intrinsic potential to give rise to risk. As such, a strategy is certainly a risk source. A success strategy brings positive effects and a bad strategy certainly brings the opposite! First of all I would like to thank you for the interesting articles providing an early view on the differences between the 2009 and the 2017 version. I would like to see you opinion on the following: you are saying that by dropping the sentence ‘This International Standard is not intended for the purpose of certification’ it now leaves the door open for possible certification. 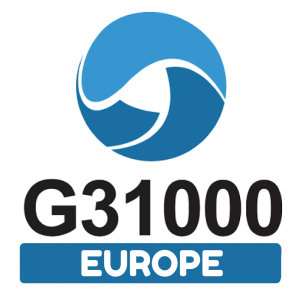 From several sources however I understand that the new name will be ‘ISO/DIS 31000:2017 – Risk management – Guidelines’, in my view this clearly implies certification is not possible, a guideline is open for interpretation and will contain non-mandatory clauses to be used as a recommendation only. You are entirely right Jan, I think this is also ISO’s take on this. However, it used to be clear in the 2009 version. Now it is less clear and depends on what people will make of it. Thanks for an earily highlight, it has called my attention to be more detailled in my understanding of ISO 3100. Could you send a copy of ISO 31000 FDIS 2017? My apologies for this late reply. Unfortunately I’m not in a position to forward you a copy of ISO/FDIS 31000 2017. I understand that the ISO 31000: 2018 will come out next month.